Known as “Russian Salad” in India, Oliviye is a popular winter salad traditionally made in Russia around the New Year. Very little is known about Russia’s culinary delights in India, with most Indians assuming there’s nothing more than meat and potatoes. In this new column, the Russia & India Report tries to bring the diversity of Russian cuisine to Indian homes. With vegetarian variants and readily-available ingredients in India, ‘Russian Kitchen’ attempts to make cooking Russian food in India an easy affair. There is one Russian dish which is available in almost every Indian restaurant and called “Russian Salad.” When I saw it on the menu for the first time, I was very happy and immediately ordered it. To my surprise the salad which was very similar to Russian Oliviye contained pineapples! Pineapple is a very exotic fruit for Russia and definitely should not be in that salad. 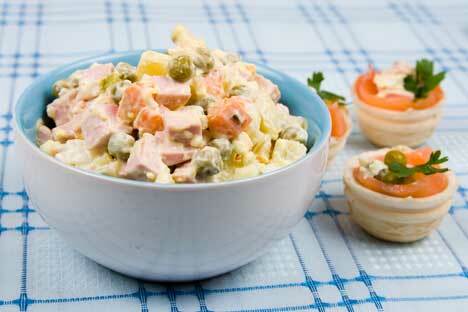 Oliviye is the most popular Russian salad that is traditionally made for the New Year. It is sometimes called “Winter Salad” because the ingredients are easily available during the winter months. For the vegetarian version, you can remove all non-vegetarian ingredients and add boiled sweet corn. 1. Boil potato, carrot, eggs. Peel it and cut into small cubes. The smaller you cut, the better it will taste. 2. Cut the onion, cucumbers and boiled chicken into cubes as well. 3. Add boiled peas, salt, black pepper, dill and mix well with mayonnaise.